Download "An Overview of Embedding Strategies in Cloud Computing Backbone Networks"
2 2 as a Service (IaaS), provides computational physical resources to cloud users, such as processing capacity, storage and routers. In this respect, customers are free to install and manage their own software stack (operating system, application, routing protocol, etc.) as super-users. It is worth noting that IaaS can be supplied thanks to virtualisation technologies (OS virtualisation, para-virtualisation and hardware-assisted virtualisation), which guarantee isolation between virtual instances sharing the same physical resources. For instance, Amazon s Elastic EC2 is a well-known cloud offering IaaS. In this paper, we will propose a new cloud infrastructure architecture called the Cloud Infrastructure using Virtualisation within Data centers and Backbone (CIVDB). It is based on a VICTOR architecture  that does not use a virtualisation technology in the backbone network. Then, we will give an overview of the related virtual network embedding strategies within a cloud offering IaaS. In fact, the customer formulates a virtual network backbone request which interconnects all its geographically distributed data centres. Moreover, the customer also determines the quality of service of a virtual network in terms of i) the routers processing power, ii) the routers memory and iii) the links bandwidth. In this regard, the cloud provider s main objective is to lease the maximum number of virtual networks while ensuring QoS, in order to maximise revenue. Note that an embedding strategy has to map i) each virtual router in a substrate router and ii) each virtual link between two virtual routers in a substrate path between the substrate nodes hosting the virtual link s extremity nodes. The problem we are investigating is NPhard and, to the best of our knowledge, few mapping strategies have been proposed in existing literature  . In this research paper, we will describe and compare the virtual network strategies already found in literature. To do so, we implemented all the strategies and used extensive simulations to gauge and evaluate each one s performance in terms of request reject rate, request revenue and request cost. This paper is organised as follows. In the next Section we will explain our proposed architecture, CIVDB. In Section III, we will formulate the virtual network embedding problem within a cloud supplying IaaS. Then, in Section IV, we will describe the main related mapping strategies. In Section V, we will analyse the performance of related mapping algorithms based on extensive simulations. Finally, in Section VI, we will conclude the paper and outline the main challenges for future research. II. CLOUD INFRASTRUCTURE USING VIRTUALISATION WITHIN DATA CENTERS AND BACKBONE (CIVDB) ARCHITECTURE As illustrated in Fig. 1, the CIVDB consists of a set of geographically distributed data centres interconnected with a Substrate backbone Network SN. The latter is formed by a set of geographically distributed routers, interconnected with wired connections (e.g. fibre optic). In fact, the SN contains two types of routers: i) access and ii) core. It is worth noting that each data centre is attached to only one access router, through which it can communicate with core routers. Thanks to virtualisation technology, many independent applications can be hosted in data centres (i.e. SaaS). Moreover, an application can be deployed in many geographical sites and makes use of a Virtual Network VN, mapped in the SN, to link all the geographical sites (i.e. IaaS). In this respect, an end-user can install any routing protocol within the allocated VN and be responsible for network administration. In other words, since virtualisation technology offers isolation, an end-user can only manage their VN (i.e. instance) and cannot deteriorate the rest of the VN s hosted in the SN. The CIVDB contains one or more Centralised Controllers (CC), as depicted in Fig. 1, in the aim of managing the cloud by i) monitoring the cloud infrastructure, ii) embedding applications in data centres, iii) mapping a virtual network in the substrate backbone network, etc. Our architecture, CIVDB, is an improved version of the VICTOR architecture proposed in . Indeed, in VICTOR, the backbone network consists of a set of Forwarding Elements (FE). Their role is limited to the simple forwarding of data according to the forwarding tables established and downloaded from Centralised Controllers (CC). It is worth noting that FEs do not implement any control plane or routing functions. VICTOR is confronted with a scalability problem since centralised controllers manage all the flows in the backbone network. In addition, VICTOR does not take advantage of virtualisation technology within the Substrate Network. For this reason, and in order to get around the VICTOR s disadvantages, we proposed CIVDB. As it uses virtualisation, many independent VN instances can be deployed at the same time in the SN. 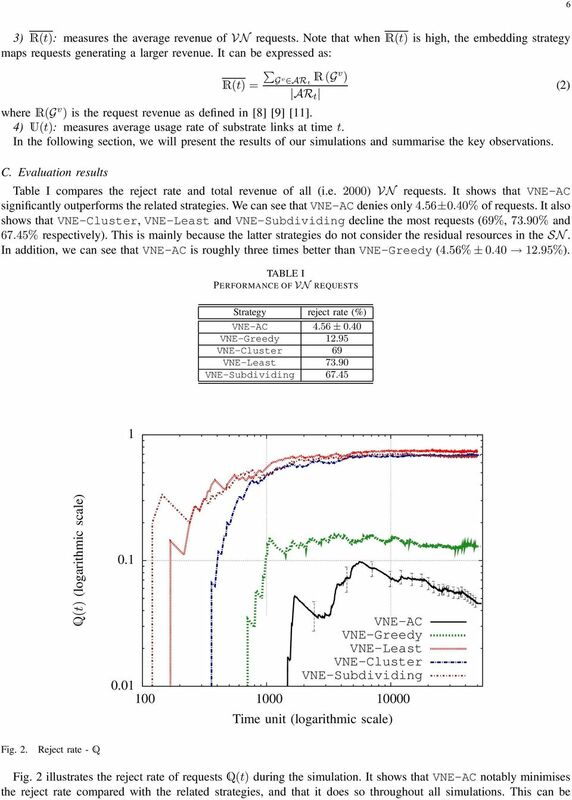 7 7 explained by the fact that the VNE-AC algorithm aims to maximise the residual resources in the SN. Thus, it avoids more critical resources and consequently prevents congestion in the SN. As illustrated in Fig. 2, it is worth noting that the request reject process starts late with VNE-AC (at 1420 time unit) compared with the related strategies in which the best one starts at 703 time unit. Moreover, the VNE-AC reject rate peak is the lowest in Fig. 2 and then decreases during the simulation. This proves that the resources are allocated efficiently. In fact, unlike other algorithms, VNE-AC is based on pseudo-randomised node selection. As proved in algorithm design randomisation, this approach leads to effective performance in computationally intractable problems. As shown in Fig. 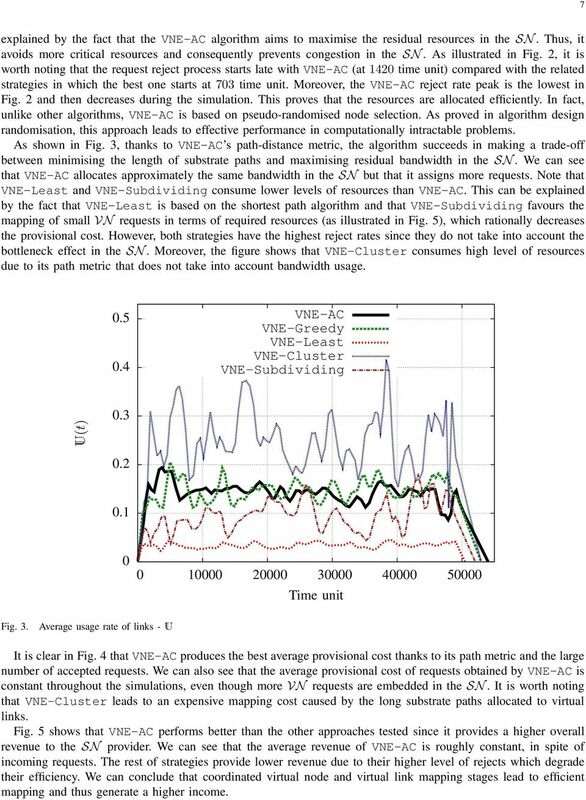 3, thanks to VNE-AC s path-distance metric, the algorithm succeeds in making a trade-off between minimising the length of substrate paths and maximising residual bandwidth in the SN. We can see that VNE-AC allocates approximately the same bandwidth in the SN but that it assigns more requests. Note that VNE-Least and VNE-Subdividing consume lower levels of resources than VNE-AC. This can be explained by the fact that VNE-Least is based on the shortest path algorithm and that VNE-Subdividing favours the mapping of small VN requests in terms of required resources (as illustrated in Fig. 5), which rationally decreases the provisional cost. However, both strategies have the highest reject rates since they do not take into account the bottleneck effect in the SN. Moreover, the figure shows that VNE-Cluster consumes high level of resources due to its path metric that does not take into account bandwidth usage VNE-AC VNE-Greedy VNE-Least VNE-Cluster VNE-Subdividing U(t) Time unit Fig. 3. Average usage rate of links - U It is clear in Fig. 4 that VNE-AC produces the best average provisional cost thanks to its path metric and the large number of accepted requests. We can also see that the average provisional cost of requests obtained by VNE-AC is constant throughout the simulations, even though more VN requests are embedded in the SN. It is worth noting that VNE-Cluster leads to an expensive mapping cost caused by the long substrate paths allocated to virtual links. Fig. 5 shows that VNE-AC performs better than the other approaches tested since it provides a higher overall revenue to the SN provider. We can see that the average revenue of VNE-AC is roughly constant, in spite of incoming requests. The rest of strategies provide lower revenue due to their higher level of rejects which degrade their efficiency. We can conclude that coordinated virtual node and virtual link mapping stages lead to efficient mapping and thus generate a higher income. 8 8 C(t) (logarithmic scale) 1000 VNE-AC VNE-Greedy VNE-Least VNE-Cluster VNE-Subdividing Time unit Fig. 4. Comparison of average provisional cost of request - C VI. CONCLUSIONS Cloud computing is new paradigm that is built on three basic principles: i) grid computing, ii) cluster computing and iii) virtualisation. 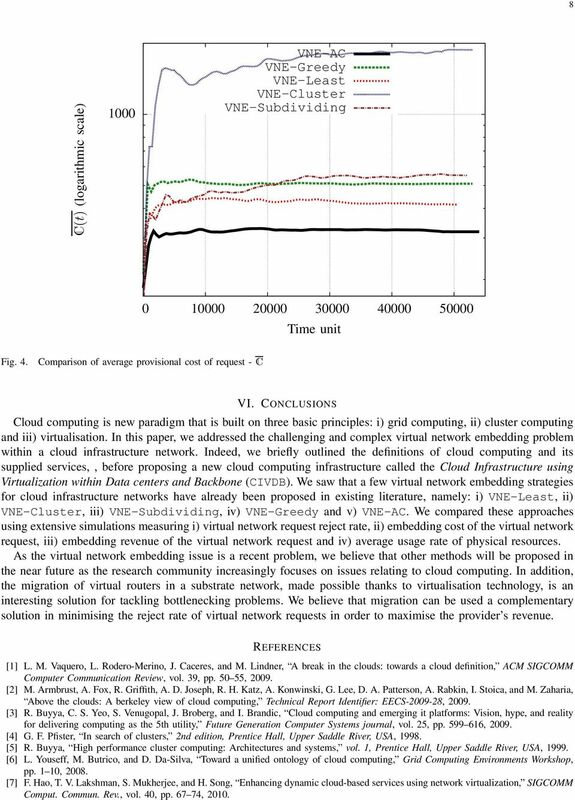 In this paper, we addressed the challenging and complex virtual network embedding problem within a cloud infrastructure network. Indeed, we briefly outlined the definitions of cloud computing and its supplied services,, before proposing a new cloud computing infrastructure called the Cloud Infrastructure using Virtualization within Data centers and Backbone (CIVDB). 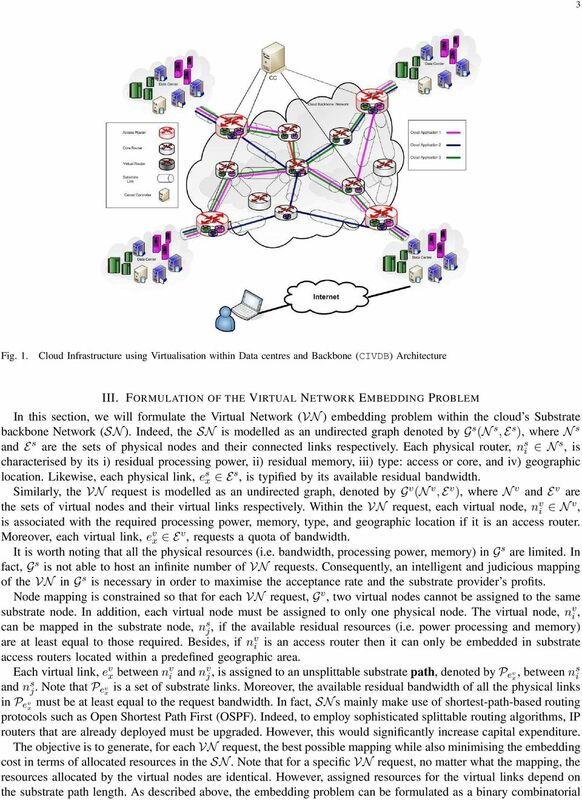 We saw that a few virtual network embedding strategies for cloud infrastructure networks have already been proposed in existing literature, namely: i) VNE-Least, ii) VNE-Cluster, iii) VNE-Subdividing, iv) VNE-Greedy and v) VNE-AC. We compared these approaches using extensive simulations measuring i) virtual network request reject rate, ii) embedding cost of the virtual network request, iii) embedding revenue of the virtual network request and iv) average usage rate of physical resources. As the virtual network embedding issue is a recent problem, we believe that other methods will be proposed in the near future as the research community increasingly focuses on issues relating to cloud computing. In addition, the migration of virtual routers in a substrate network, made possible thanks to virtualisation technology, is an interesting solution for tackling bottlenecking problems. We believe that migration can be used a complementary solution in minimising the reject rate of virtual network requests in order to maximise the provider s revenue. REFERENCES  L. M. Vaquero, L. Rodero-Merino, J. Caceres, and M. Lindner, A break in the clouds: towards a cloud definition, ACM SIGCOMM Computer Communication Review, vol. 39, pp ,  M. Armbrust, A. Fox, R. Griffith, A. D. Joseph, R. H. Katz, A. Konwinski, G. Lee, D. A. Patterson, A. Rabkin, I. Stoica, and M. Zaharia, Above the clouds: A berkeley view of cloud computing, Technical Report Identifier: EECS ,  R. Buyya, C. S. Yeo, S. Venugopal, J. Broberg, and I. Brandic, Cloud computing and emerging it platforms: Vision, hype, and reality for delivering computing as the 5th utility, Future Generation Computer Systems journal, vol. 25, pp ,  G. F. Pfister, In search of clusters, 2nd edition, Prentice Hall, Upper Saddle River, USA,  R. Buyya, High performance cluster computing: Architectures and systems, vol. 1, Prentice Hall, Upper Saddle River, USA,  L. Youseff, M. Butrico, and D. Da-Silva, Toward a unified ontology of cloud computing, Grid Computing Environments Workshop, pp. 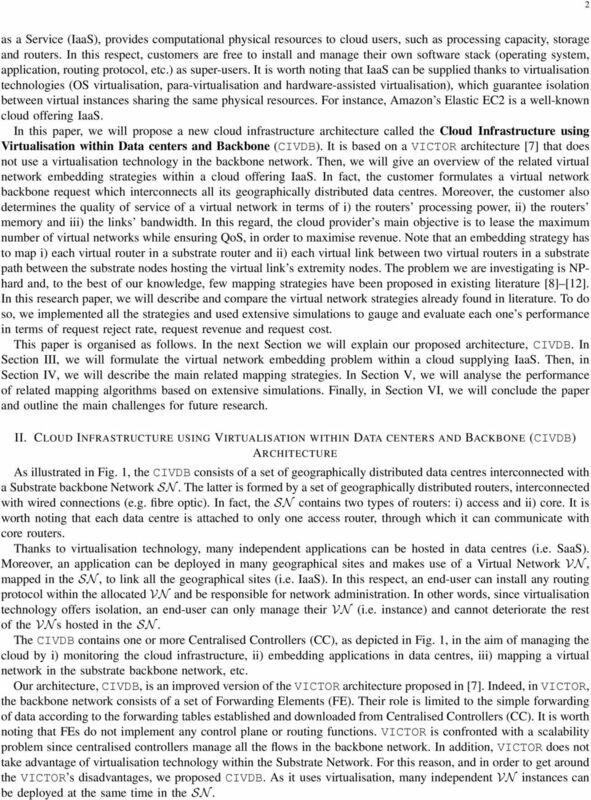 1 10,  F. Hao, T. V. Lakshman, S. Mukherjee, and H. Song, Enhancing dynamic cloud-based services using network virtualization, SIGCOMM Comput. Commun. Rev., vol. 40, pp , 2010. 9 VNE-AC VNE-Greedy VNE-Least VNE-Cluster VNE-Subdividing R(t) Time unit Fig. 5. 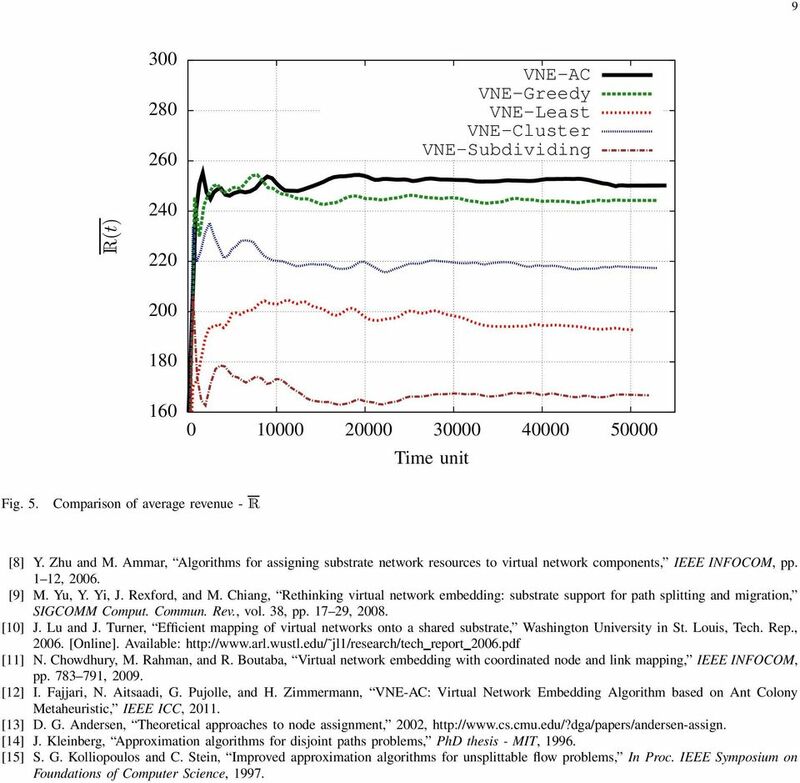 Comparison of average revenue - R  Y. Zhu and M. Ammar, Algorithms for assigning substrate network resources to virtual network components, IEEE INFOCOM, pp. 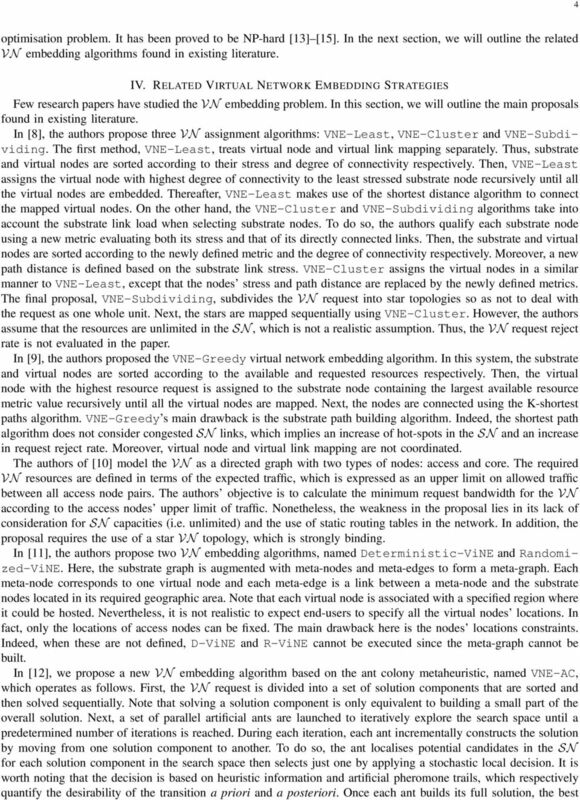 1 12,  M. Yu, Y. Yi, J. Rexford, and M. Chiang, Rethinking virtual network embedding: substrate support for path splitting and migration, SIGCOMM Comput. Commun. Rev., vol. 38, pp ,  J. Lu and J. Turner, Efficient mapping of virtual networks onto a shared substrate, Washington University in St. Louis, Tech. Rep., [Online]. Available: jl1/research/tech report 2006.pdf  N. Chowdhury, M. Rahman, and R. Boutaba, Virtual network embedding with coordinated node and link mapping, IEEE INFOCOM, pp ,  I. Fajjari, N. Aitsaadi, G. Pujolle, and H. Zimmermann, VNE-AC: Virtual Network Embedding Algorithm based on Ant Colony Metaheuristic, IEEE ICC,  D. G. Andersen, Theoretical approaches to node assignment, 2002,  J. Kleinberg, Approximation algorithms for disjoint paths problems, PhD thesis - MIT,  S. G. Kolliopoulos and C. Stein, Improved approximation algorithms for unsplittable flow problems, In Proc. IEEE Symposium on Foundations of Computer Science, 1997. A Comparative Study on Load Balancing Algorithms with Different Service Broker Policies in Cloud Computing Sonia Lamba, Dharmendra Kumar United College of Engineering and Research,Allahabad, U.P, India. Journal of Theoretical and Applied Information Technology 20 th July 2015. Vol.77. No.2 2005-2015 JATIT & LLS. All rights reserved. ORGANIZATIONS ARE GOING TO THE CLOUD: WHICH COMPETENCES FOR THE IT MANAGER? MAXIMIZING RESTORABLE THROUGHPUT IN MPLS NETWORKS 1 M.LAKSHMI, 2 N.LAKSHMI 1 Assitant Professor, Dept.of.Computer science, MCC college.pattukottai. 2 Research Scholar, Dept.of.Computer science, MCC college.pattukottai. in the figure below. Index Terms Cloud Computing, SaaS, Load Balancing.